North Commons Park	The park and Recreation Center feature spacious grounds, beautiful scenery and many amenities. 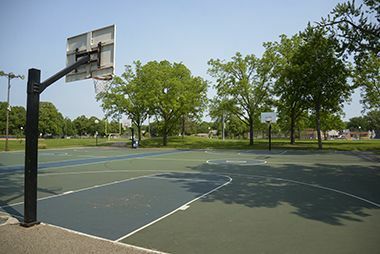 Basketball Courts are sponsored by the Minnesota Timberwolves and Lynx. 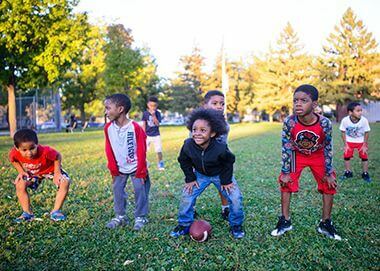 Name: The park was named North Commons on September 16, 1907 at the suggestion of the North Side Commercial Club, because of its location in the city. Acquisition and Development The park was purchased in 1907 for $48,875 from L. P. Henry and others. The board’s first resolution to acquire the land on June 3, 1907 included the purchase price. The fact that a price had already been arranged suggests the board had been actively involved in negotiating to buy the land before that date, although no record of formal decisions to that end exists. 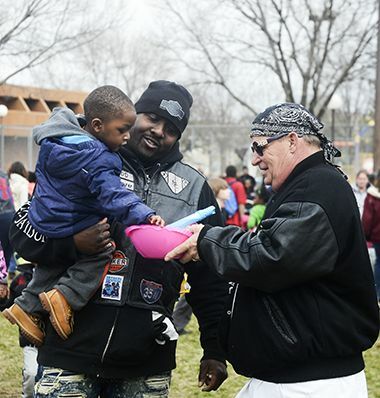 There was a long history, however, of agitation to provide another park for the north side in addition to Farview Park. In 1889 the board had designated for acquisition a slightly smaller parcel four blocks to the west, an area called Todd’s Pond, which later became the football field at the first North High School. At that time a large majority of landowners in the neighborhood objected to the purchase, or more precisely they objected to paying for it by assessments on their property. The argument they used was that the proposed site was near Farview Park (then still Prospect Park). The board abandoned that acquisition in early 1890. In the 1907 annual report, park superintendent Theodore Wirth provided a plan for the development of the new park, which included mostly landscaped areas, but did provide a place for gymnastic apparatus and a “sunken lawn” for games and a skating rink. Wirth noted that he anticipated “early demand” for improvements and that his plan would serve “young and old alike.” Playground equipment was installed at North Commons in 1908 following the board’s highly successful introduction of playground apparatus in other parks in 1906 and 1907. 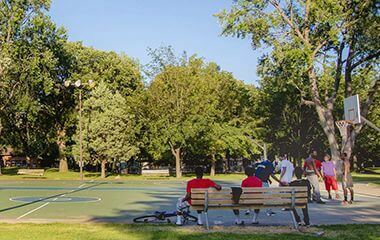 It was one of the first five parks to receive basketball goals in 1908. 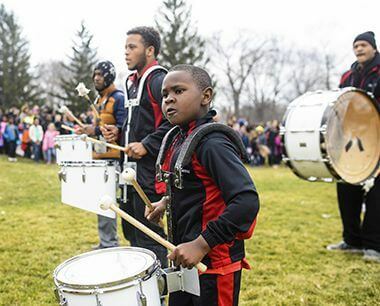 It was also one of six parks, other than Lake Harriet, to be put on the summer schedule of free concerts that year. The first major improvements to the property were scheduled for 1909 but they were put on hold due to what Wirth said was a shortage of laborers and horse teams available for hire. In 1910 the park board began improvements to the park and built one of the park system’s first three year-round “field houses” at North Commons. The building at North Commons was larger than those built at Jackson Square and Camden (Webber) Park, although Wirth noted that plans had to be modified to cut costs. It was essentially a warming house for skaters, in the unfinished half-basement, with toilets and one large open room on the first floor. The total cost of the shelter was just over $16,000. The improvements also included more space for playing fields than Wirth had proposed in his first plan for the park. By 1911 North Commons had already become one of the parks most heavily used for sports. 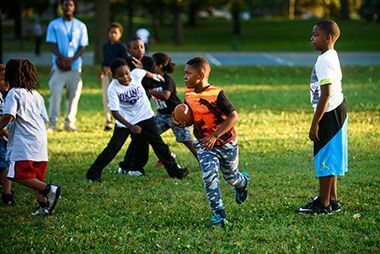 Football goalposts were installed at North Commons and there was such demand for playing space that, along with The Parade, North Commons was the only park in which permits were required to use the baseball and football fields. In 1912 a wading pool, one of the city’s first, was built in the park. 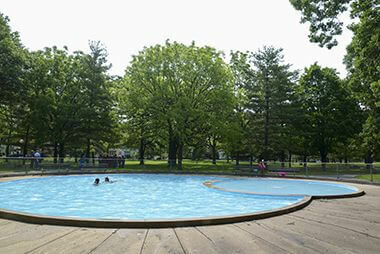 (From the creation of one of the city’s first wading pools at North Commons, the park has been foremost among city parks in swimming facilities, with later additions of a swimming pool and water park. 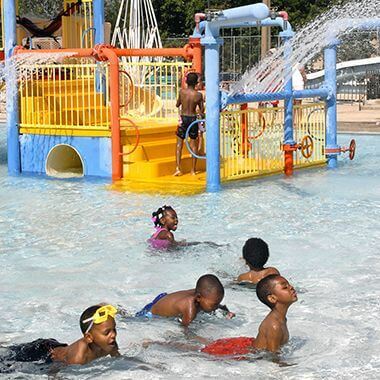 The addition of swimming facilities there has been part of an effort to distribute water-based recreation facilities more equitably across the city. People in the southern half of the city had relatively easy access to natural water—lakes—for swimming.) The park also got its first tennis courts in 1912. North Commons, and neighborhood parks in general, got the short end of the stick, however, in this period of extensive park development elsewhere in the city. In both 1909 and 1913, as major park-shaping work was being done around the lakes, work at North Commons was not completed due to a shortage of labor. The result was a park that was in Wirth’s words in 1912, “to say the least, unsightly and unsatisfactory” in its “half finished and torn up condition.” By the end of 1914, most planned improvements had been made to North Commons—grading, filling, and the addition of more tennis and basketball courts—and Wirth noted that “on the whole North Commons makes a good appearance and is one of our most useful and most frequented parks.” At that time, more had been spent on the improvement of North Commons than any other neighborhood park in the city, other than Logan Park, where a much larger and more expensive ($40,000) fieldhouse had been built in 1912. The focus of the park board, however, remained on developing the system of parkways and parks bordering the city’s most prominent natural features, its lakes and the river. But even such less-substantial projects as the construction of The Mall between Hennepin Avenue and the Calhoun-Isles lagoon and the construction of King’s Highway near Lake Harriet had consumed substantially more of the park board’s resources In 1915, Wirth proposed additional funds to complete a driveway through North Commons, a driveway that had not appeared in any earlier plans in annual reports. The east-west drive through the park was completed in 1916, along with installation of a backstop for the baseball field, and a bandstand. A fifth tennis court was added to the park in 1917, when Wirth noted that the south section of the park had finally been completed. Along with these improvements came heavy use. 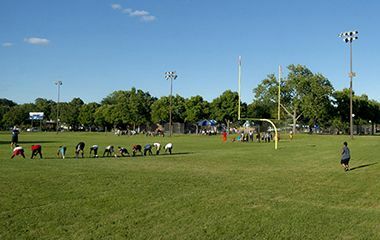 By 1921, Wirth noted that the playing fields were possibly the most frequented in the whole park system. He recommended then that the small shelter be replaced with a larger fieldhouse, a suggestion he would make several times in the 1920s to no avail. The catch was that the fieldhouse would only be built if residents of the area agreed to pay for it with property assessments. 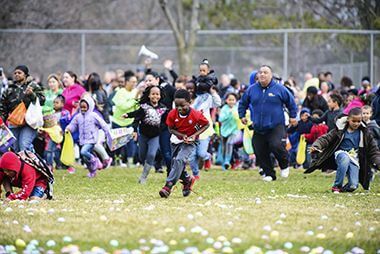 This was at a time when almost all neighborhood park improvements throughout the city required the approval of local landowners to pay for it. In 1921 Wirth wrote that the district could afford a new building that would serve its needs. The continued popularity of North Commons, and the lack of funds to improve it further, was indicated in 1924 when Wirth suggested that plans to improve the driveway through the park be abandoned and the park converted exclusively to pedestrian use. By 1928, attendance at playground activities at North Commons almost doubled that of any other park in the city. A huge participation in diamond ball, what later became known as softball, was noted at North Commons. 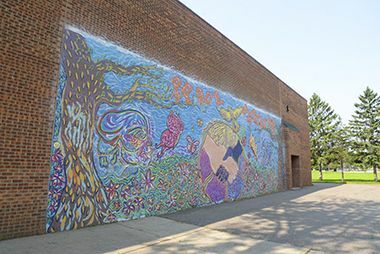 Through the difficult days of the Depression and World War II, the park board had little money to spend on improvements of any kind and the opportunity to build a new field house had passed. Although North Commons was one of only a few parks that offered year-round activities in the 1930s and 1940s, the park would await the coming of better times for improved recreation facilities—as was true of every other park in the city. In 1955 and 1956, improvements were made at North Commons for the first time in more than thirty years. The playing fields were enlarged and regraded, play equipment was added and a new concrete wading pool was built. The shelter built in 1910—and outdated by 1921 in Wirth’s opinion—was not replaced, but it was modernized and was designated as one of six district community centers in the park system. The park board’s 1956 annual report claimed that attendance at the park tripled after its modernization. 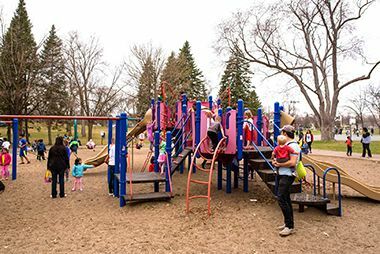 The venerable old shelter was finally demolished and replaced with a new community center with a gymnasium in 1971, one of the first new centers constructed at the beginning of a building boom in Minneapolis parks in the 1970s. Two years later, an outdoor swimming pool was built at North Commons, making it the first—and still the only—Minneapolis park with both a gym and a swimming pool. 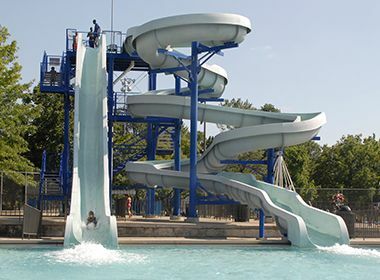 The swimming pool was closed in 1997 and reopened a year later as the North Commons Water Park—with gadgets, geysers, slides, and funbrellas!—another first in Minneapolis parks. 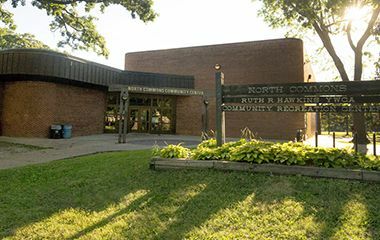 The community center underwent renovation in 1999 and that year the North Commons outdoor basketball courts were renovated with a gift from the Minnesota Timberwolves. In 2000, the North Commons community center was one of the first five city park facilities to be outfitted with a computer lab. The North Commons tennis courts were rehabbed in 2004. 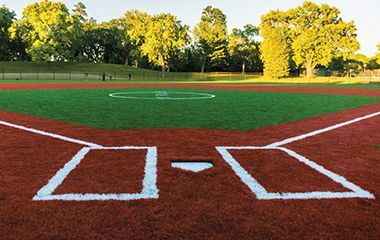 In 2011 the Minnesota Twins and Toro Company joined forces to upgrade a North Commons baseball field into a high-quality competitive field. Also in 2011 a Nice Ride bicycle rental kiosk was installed at the park. History through 2008 written by David C. Smith, with updates from 2009 to present written by MPRB. North Commons Recreation Center offers programming year-round. In addition to the water park, North Commons has a free wading pool. See our other wading pool locations.